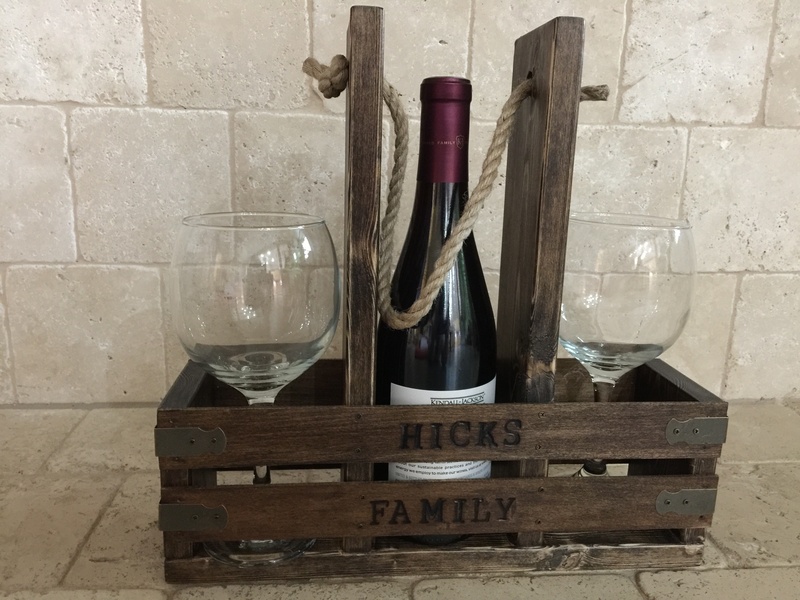 DIY Wine Caddy and YouTube Video! Oh hey friends! It’s almost New Year’s and we have a super fun and easy project for you! This would be great to tote along to your New Year’s party! You can see our how-to video on our YouTube Channel HERE! This is a really fun and simple build guys. You can download and print the FREE PLANS by clicking HERE! First step is making your cuts. We made all of our cuts using a miter saw. You can see the cuts for the 1×4 here. After making your cuts, clamp the two long pieces together, and drill a hole at the top of these boards. You will put rope here later. Next, we attached our small short pieces to our long base using wood glue and 1.25″ brad nails through the base piece and into the small side pieces. Add glue to one side of each small piece first. We used our Ryobi 18V brad nailer to attach the side pieces like this. Now your caddy should look like this! Next, we attached our longer boards with holes. We did this using wood glue and brad nails as well. You can see they are all spaced evenly on the bottom board. We attached these using wood glue and brad nails as well. Final step was adding stain, rope and hardware. We stained our caddy Briarsmoke by Varathane, and we spray painted hardware and attached them to the caddy using our drill. We used these corner pieces from Home Depot. When I drill in the hardware, the screw is running into the nail in some spots. How do I get around this? Could you please tell me where you got the rope? Also, what size screws did you use to attach the corner brackets? How did you write the HICKS FAMILY on the wood?? That’s super cute!! I used the Walnut Hollow wood burning tool and hot stamps. (available at amazon, Michael’s and Hobby Lobby) They are cheap and I just practiced a little bit on some scrap.I know I will use it in the future so it was well worth it. Hi Shanty2Chic, I love this, awesome project! Thnks for sharing… Hi Melissa. where did you get the corner pieces? Thnk-you. Thanks! I found them on Amazon. They are considered to be box making accessories. Rockler has some as well. Perfect….I was just invited to wine glass painting party. This will be perfect hostess gift! Thanks for posting!!! I love that you do video AND step by step instructions on your projects!!! What stain color is this? What model miter saw did you use? Thanks. Cute project. Where do you buy your 1″ craft board? I cannot find it at my home depot. You can find it at craft stores: Hobby Lobby, Michael’s….